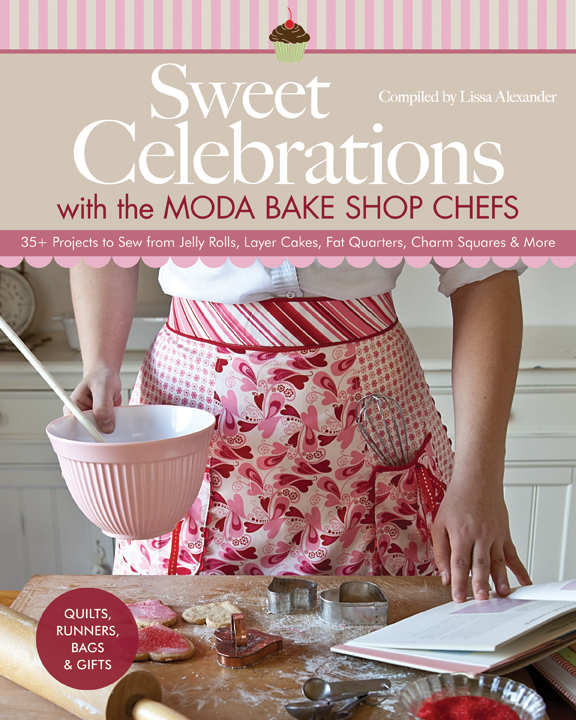 Today is my turn on the blog hop to tell you about the new Moda Bake Shop book – Sweet Celebrations. It will be available in stores soon but you can pre-order from Amazon now. I was absolutely wrapped when I was asked to submit three projects for the book. It has been an exciting and interesting journey for me which I can now share with you and tell you about the book (or well, just enough to wet your appetite). I had the privilege to work with a bunch of talented chefs who have designed the most beautiful quilts, home decor and fun projects for every celebration on the calendar. 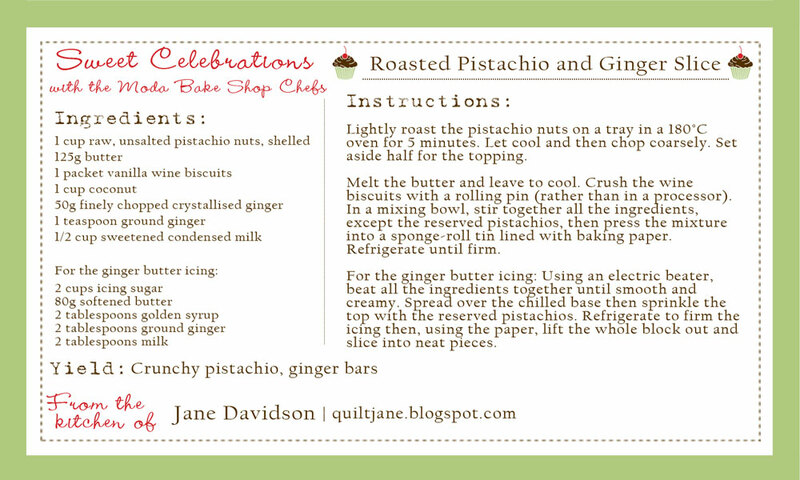 As part of the blog hop I will be sharing with you my favourite recipe for a Fathers Day celebration. In our house it usually starts with the full cooked breakfast on the BBQ followed by a relaxing day. While dad is lounging on the sofa, wrapped up in his favourite quilt, he will be munching on Roasted Pistachio and Ginger Slice. The Ginger in the recipe is grown locally in Yandina, 100kms north of where I live. Download the recipe here and collect all the recipes along the way to keep with the book. Also as part of the blog hop, Moda have sent us some questions to answer so you get to know us better. I am hoping to meet many of you at Market and say hello. 1. Do you prefer to celebrate with cupcakes, cake pops or just plain old cake? I have no idea what a cake pop is but we usually have some sort of cake made traditionally or from biscuits stacked and glued together with melted chocolate. 2. What is your favourite part of quilting – fabric selection, piecing, quilting , binding and why? I love it all (I lie, binding can be tedious). I love selecting the fabrics, cutting, stitching,pressing my seams open (ooh ahh!) and seeing a quilt come together. I get excited about the quilting design and thread I am going to use to complete the quilt. It is so rewarding to place the last stitch in the binding, scrutinise the quilt to find every last loose thread and give it to someone you love. I am having fun at the moment learning how to photograph quilts. 3. Do your pets/kids/spouse help or hinder your creative process? My gorgeous kids are always in my quilt room chatting away or playing with toys. They have no interest in what I do, being boys but I know they appreciate what I make as they are always snuggled under my quilts. My husband in his own words, “I just don’t get quilts and quilting”. That makes me laugh. My dog stays with me all day when I work and when he wants to play he brings the ball and hides it in the fabric piles or nudges the quilt I am working on as if to say, “what about me”. I guess, they all inspire and assist me in the creative process even if quilting is not their ‘Thing’. 4. What have you gained from the on-line quilting world. I have gained so much inspiration and support from the world wide quilting community. I have made so many lovely friends who continually teach me new techniques and tricks and encourage me to keep on doing what I love the most (after being a mother etc) – quilting. I really enjoy all the blog hops and bees I have been invited to participate in. 5. When you picture Oda May, what does she look like? 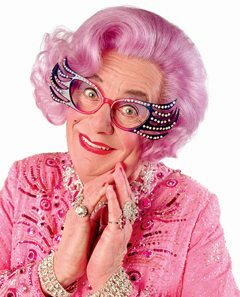 I know she looks nothing like this but Dame Edna pops into my mind. A wise, stylish woman with a wicked sense of humour, a killer pair of glasses and a master of the needle and thread. To celebrate the launch of this new Moda Bake Shop book, I would like to give one lucky blogger a Kasuri Layer Cake and a copy of the new book – Sweet celebrations. 2. Leave me a comment telling me what Pen name you would give yourself if you wrote a novel. I would call myself – Jasper Threadmore. Entries close 14th October 2012 AEST and winners will be announced 19th October 2012. Don’t forget to visit all the chefs on the blog tour and collect the recipes to be in the draw for some great prizes. October 14 – Readers have until midnight to comment at all participating blogs. October 19 – Winners Announced. What else other than Efemera Ink….great giveaway and a fab looking book. Thank you for the recipe and giveaway! I am looking at your blog for the first time today, but can tell you that I will be back! Olivia Aull would be my pen name, not creative, but I'd always LOVED my middle name! I follow your blog. Can't wait to see this book! If I were to choose a pen name I would use my paternal grandfather's family name before it was Americanized, so I would be Maria Castelluccio. I'm following you on Facebook! Hmmm, a pen name, perhaps Sooli Sewista! Love the Tim Tam cake, can never have too many Tim Tams. I'm a follower. Loved your answers! I love your sense of humor almost as much as your projects! I'm following your blog now, and my pen name would be something oh, so sophisticated, such as Laura Shannon. Really like your blog. I'll be back to see what else you have to share. and really like what you are sharing. Thanks for the chance to win. I sure do love your pen name idea!!! My pen name would be Josie Gray. Cute? I just followed you on twitter & liked you on facebook!! I'm following you here on your blog. Interesting about the cake. I've always been in awe of those that can write novels, what a wonderful talent. But a pen name for me? I guess maybe I'd call myself Lucinda Lee. A favorite band teacher gave me that name back in elementary school and it's always been stuck there. I am indeed a follower of your blog! Hmmmm, a pen name? Perhaps I would use Stashella Fabriqua. Thanks so much for a chance at the give-away! I have become a new follower and definitely will be back. I would use the pen name of penink. How's that for a name? I am sure that everyone by now really wants to win that book that is so awesome. Moda is just unbelievable when it comes to giveways. Thanks for the chance to win. Will certainly enjoy your recipe. Good for you for your 3 projects that you have worked on that are now in the book. I wouldn't want a pen name, I'd want everyone to know I wrote the book! My pen name would be Sally Lemon. I am now a follower of your blog. Thanks for the chance to win! I look forward to seeing more of your work and it looks like I will enjoy checking out your blog. This is my first time on your Blog and have enjoyed it. Don't have any idea what a pen name would be for me. I facebooked yah!! I would be Dawson Darner. I LOVE Kasuri!!!!! I'm following your blog AND your Facebook! If I had a pen name it might be Hermione Withershins. But that might scare people off, so I'd go with my real first name and my maiden name, Jean Parker. Short and sweet. I've started following your blog just recently and am happy to read you! I became a follower. I guess I would be Ruby Red since that is my favorite color & I live on Ruby St. I am a new follower to your blog. This book looks fabulous. If I were writing a book my pen name would be Nellie Needsaneedle. If I wrote a book, I'd have a name that meant something really special to me, Daisy Pearl, after my grandmother and her mother. My grandmother always made me feel as if I mattered and I'm very grateful to her mother for helping her be who she grew up to be. Thanks for the question – my name would be Penelope Q. Block and I would want to look like Dame Edna! Thanks for the chance to win the book and fabric – have a lovely weekend! Piece…. My pen name would be Ima Quilter. Hmm…I would chose a pen name of… Erica VonSchlempt. lol. Sounds authoritative and "don't mess with me". New follower of your blog in reader. I think my pen name would be Maggie Manderville. I'm following you on Facebook! Thanks for the giveaway! Fun question. My pen name might be Nottalotta Words – it would be a very short novel! Thanks for the chance to win! I follow you on twitter. My pen name would be Molly J.
I think my pen name might be Annie Rose. Don't know why, but it just popped in my head and sounds just right! Your recipe looks really yummy! Hum, a pen name for me? Cecilia Reedsmore (get it?) LOL I love to read but if I get into a good book, then it cuts into my embroidering and quilting time. Thanks for the giveaway! I would pick Jandy, it already works for me. Looking forward to the book and I do follow you!! I just started following your blog. I was able to visit Australia three years ago and absolutely loved it! The only part of Brisbane that I saw was the airport, however. 🙁 Hmmm, pen name? First name would be Jessalyn, just because I like the name, but I don't know about the last name. Maybe something simple like Carter or Harris. Good thing I don't see myself becoming an author! If I wrote a book, I'd be "Anonymous" because I'm never been a very good writer. There are a lot of things that I'm very good at but writing was never one of them! Hi, I'm a new follower by email. Hmmmm..never thought about this, but maybe I would choose to be Agatha Austin (in honor of Agatha Christie and Jane Austin?)! I have been using Dungeonquilter for a long time as a screen name, and would probably include it somehow in a pen name. I love the Kasuri line. I'm a follower! Melody Lock would be a fun pen name! Thanks for the chance to win! I'm horrible at naming things so I will have to come back for another entry if something hits me later my pen name. Following your blog – had to laugh about boys, husbands and quilts. My husband always asks – which door is that rug going by? – it's a quilt dear! I have three (now grown) boys and they like to have a "Mom-made" quilt but really don't get why I love making them so much. Pen name – just the initials KKJ – not my real initials, just like the look and sound. Enjoyed your post! Thanks for the recipe and giveaway. I had never thought about a pen name…maybe Casandra Irving. Where did that come from?! Hilarious! I'm a follower – thanks for the giveaway. My pen name would be Weston Friend (family names). Thanks for sharing the recipe & thanks for the chance to win. This is so fun!! Thanks for the chance to win. I LOVE all things MODA! My pen name would be…Amelia Stitchums. Love your blog, I will definitely be following from now on! I would choose Quilty Jones for a pen name! I guess I could use my high school nickname for a pen name – Swirl Earl! I have never thought of a Pen name (my Dad has one…). I used to call myself Karen Quiter when I was a kid and we played FBI agents or Cop or other games where you needed a secret identity (my brother drew us up official papers and passports to match too.) Rose Creations is the name of my blog. So something with Rose in it, as it is also my middle name. Possible Karen Rose Quilter (See what I did there?) Hahaha. I started following your cute blog. I'm a self-employed bookkeeper. My pen name would be Sarah Roberts. Hmm… a tricky one that, a pen name. Maybe something like Fred Needle? A cake pop is like a lollipop, kind of like a cupcake on a stick. I haven't had any, but they sell machines that make them. Jane-the-quilter I'm stalking you…trust me its a good thing :). MY pen name would be JP Batik. I follow you on facebook and you blog. I love this book and the layer cake and the two would really go together well. My pen name would be "MomoZelda" My mother almost named me Zelda (I know) lucky me but she didn't and when my youngest daughter found out, being the smarty pants she is (she is 26 now), she started calling me MomoZelda for fun and it stuck or at least "Momo" did. It was fun. Dusty Twister Tee. One of my daughters at the age of 6 or 7 had a phase of riding a stick horse everywhere. That was her cowgirl name. Sooo cute. Thanks for the chance to win a bit of new fabric! This blog of Moda's is great–introduces me to new blogs to track. Your sons have great smiles! My pen name would be Charity Awl. My pen name would be Halisha Hoopelstein. That's the name I gave myself as a child when I decided mine simply wouldn't work anymore! I thought I stalked you everywhere, but I just realized that I had missed FB. No worries. I'm stalking you there now, too. *evil grin* I think Charles Dickens always had the best names for his characters, so I would like my pen name to be Dickensesque. Hmmmm. How 'bout Tess Spoolhardy? Thanks for the chance, m'dear! I sure would love to snag a copy of this great book! I went, I saw, I "LIKED", now I want to win. LOL … I am going to follow you on facebook, because that is where I spend most of my computer time. Thanks. I had to laugh when you asked for a pen name as a writer, I couldn't come up with anything so I asked my husband and he came up with "Angle Quilton" Don't know where that came from but it sounds fun. I always said I would use my maiden name as my pen name. Mildred Maude. My sister was named for two of our great grandmother. Jennie and Elizabeth. Mildred Maude was the other two great grandmothers names. I follow your blog via RSS feeds. My brain isn't cooperating tonight, so no creative pen name. I would be Jamie Adams. Thanks for the chance at your giveaway. I am now following you on Facebook. In 2001, I had the pleasure of visiting Brisbane and then headed up to Harvey Bay/Fraser Island. Love Australia. We had a chance to live in Nelson Bay, NSW for 6 months where I got to join a patchwork group. We still keep in touch! My new pen name would be Aussie Loo Loo. My sister was named for two great grandmothers. Jennie and Elizabeth. The other two great grandmothers were Mildred Maude. Love your blog, I will be following. You have a great sence of humor. Your boys are such cuties, I have 2 adult sons , they don't get the quilting thing either, It could be because both ot their "old bedrooms" are loaded with fabric, threads, and notions… My husband tolerates it because he is the one who got me back into sewing years ago, and I made him a quilt for our 25th aniversary..
Can't wait to make your recipe, sounds awesome. I've never hear of vanilla wine biscuits, are they similar to vanilla cookies or a shortbread cookie?? I love the layer cake your adding to the fun and I can't wait to see the book. going to follow you on facebook, that sounds like i'm a stalker aright. I would be Crafty sister. I got so interested in your blog, I forgot to answer the contest question. I would be Ima Bibliophile! I guess my name would be Paula Patchwork! I would be Peggy Quiltamom. I always wanted to shorten my name to Peggy but my mom was adament that my name was Margaret. I follow you wherever you are. I think my pen name would be Charlotte Blayney! I'm a happy follower and love that Kasuri fabric. Hmmm, a pen name? How about Niji Kiji? That's "rainbow fabric" in Japanese. Checking out your blog! Hmmm… can think of a few pen names like Sandy Beach, Reid Books, or Lotta Fabric but, I think I'll go with Windy Dawn. Thanks for a chance to win. i'm a blog follower and i've just liked your fb page. i would be carla cuttenkit should i write a book or two. I think I'd go as Stitchin' Kate. Enjoyed reading about you! I'm a new follower. Can't wait to check out your blog. Wow- I've never thought about a pen name. What about Grace Elisabeth Bennett. I love your Kasuri fabric!!! I am now following your blog. Oh I have no idea what pen name I would use. I know this doesn't make sense but Collects Fabric?? Once again I love your new fabric collection!!! I am a follower of your blog, I tweet with you, I like you on Facebook and I get your emails. WORD: Stalking…………. …and my pen name would be Daisy Thimbleton. No idea why, it just came to me! Shame I can't write! Thanks for the lovely giveaway. I am now a follower. I just took a look at your tutorials. I love the Flying Kimonos quilt! If I would be a writer, I probably would use my own nam, Marja van de Nes, which translated in English means Marja from the Edge. Which sounds rather nice, doesn't it? I am a follower of yours. Funny, I picture Oda the same way! Hmm.. A pen name. How about Kitty Sleepy! I would love to sleep as well as my cat does. Pen name?…Irene Shelton…don't know why…I am a follower. Thanks for being so generous. I've like you on your FB page under the name Pat. I have to tell you that we've recently gone a little bonkers over using fresh ginger, what a treat, so I can't wait to try your slices! My pen name would be MeeMee Puffin. I Liked you on Facebook. Great post, super funny! Pen name, Sweet Victory. Because if I penned a novel it would be. Yours is the 3rd recipe I'm printing. If I was an author my name would be Samantha Hamilton. Just like the sound. As to a pen name, I think I'd be too proud of myself to use a pen name! I follow your blog! Lovely giveaway! My pen name would be Ginger Jackson. Congrats on the book – can't wait to see it! Thanks for the wonderful giveaway too! I found you on Twitter via TulaPink, now I'm following your blog. Love it! My pen name: Elizabeth Finley, after my two kiddos. I am a new follower of your blog. Love it when I find Aussie ladies on Blog Hops. I am from Newcastle NSW. I follow your blog by email. I love to receive your posts…keep them coming my way! My pen name would be Madeline Grey….why? I don't know…I just like that name. My pen name would be Elizabeth Lorraine. My pen name would be Kenzie Leigh…because I like to write K and L! My pen name would be Abbigail Pensive. I follow you on Twitter, Facebook, and your blog. My pen name would be Betty Readmore. I follow you via Google Friend Connect. Thanks for being part of the book and the blog hop. If I were to choose a pen name, I think I'd pick Susannah Shaw, a variation on my aunt's name. My pen name would be Abby Normalle. Thanks for a great giveaway. If I were to write a novel, I would change the spelling of my first name to Jacqueline, and my last name would be something equally French, Jardin (even tho I'm not French!). Thanks for the give away! I love your giveaway! I am thinking I would need to call myself Piecemaker Josie…my motto and my nickname…writing a book would be fun… I have always dreamed of writing a childrens' book. I am now following your blog. LOVE the Kasuri fabric line! I think Dixie North would be an interesting pen name, especially for someone like me who has lived in both New England and the Deep South. Those tim tams are deadly. Thank goodness they're only available in my area during the holidays. We can't get enough of it. They are just so yummy with hot chocolate. I haven't thought of writing a novel so I can't really think of a pen name. My pen name would be Hendricka Schuller …my great grandmother. I might go with Isabel Creighton as a pen name. I am a new follower – love the Kasuri fabric. My pen name would be Breve'. Just one name. My Pen name would be C.C. for I was raised in the City and now live in the Country. I am now following you on Facebook and added your blog to my Google reader. My pen name would be Quinona Quilter. I do not know why but the alliteration sounds good. Thank you for the contest. My pen name would be Diana Lightmore, the name I almost got. I'm just now being introduced to your blog! My pen name would be Florence Johns. What a fun question. No idea why but I'd go with Madeleine for a pen name and probably my real last name 😉 Thanks for the giveaway. So excited about the book and love the Kasuri fabric! I enjoyed your blog and the recipe! thanks – I am a new follower now! My pen name would be Sophie Brookside! thanks! I am a follower with RSS! Cool question. I haven't given it much thought. I'm sure I could come up with something better if given more time, but since this is a time sensitive thing I'll go with Mistress Needles. Hmm, a pen name…this is torture for the indecisive like me. Sofia Ionatti or Evelyn Dasher perhaps. I do love the Eileen Dover that someone else chose, always a guaranteed chuckle for me. Thank you for the lovely giveaway! Woo glad I found your blog!!!! Something Jane Austin related – Darcy Fitzwilliam! I am a loyal fan of yours Jane! LOVE Kate Spain's new line. Hmmm…my pen name would either be Dee Major or Qwerty Stitches. My pen name…. Julia Paradise. That was my great-grandmother's name, but she died when my grandmother was only six months old 🙁 SHe needed to have more of a voice in this world, so I would use her name. THanks for the giveaway! My name would have to be Pearl Wilson. First of all your boys are adorable! I am following your blog now, so glad I found you! I am following you on pinterest, but couldn't find you on fb, darn! My pen name sould be Silly Sally. I actually collect children's books. If I were ever to write a book it would rhyme and would have watercolor pictures. My two favorite types of books! Gosh…..pin name La la freeze. My pen name — I have no idea. Perhaps "Sue Tired"
I stalk you sometimes on here, and sometimes on FB! My pen name would have to be Ginger Marmora (worked out the same way as the supposed method for your adult movie star name….first pet name – Ginger cat and name of the first street you lived on as a child – Marmora Tce)…so that's even how I came up with the name, bit TMI I know, but such is life when you deal with my brain! I now stalk you on facebook!!! I'm a follower! Love your designs! Some of them have a modern feel to them — LOVE! I've always loved those one name (last name? first name?) pen names. So I'd go with something ambiguous like Calyth. Pen name….hmmmmmm. How about Calliope Sands. My pen name would be Katie Mac! I am following you on Facebook and I guess my pen name would be Beezwiz. I LIKED you on FB under my real name, which I'll reveal if you choose this post. My pen name would be Samantha Fairfax–sounds very British! I would be Franny Cheshire if I would write a book, but don't look for me on your library shelves. I love that you picked the question of what your pen name would be. Mine would probably be something like Aspen Cullmore. Try as I might, I can't think of a pen name. I would have to leave the choice to my daughters I think. They're much more imaginative than me. I'm a new follower to your blog – love your style and creativity. I have never thought about using a pen name, always figured if I wrote a book I would want everyone to know it was me! I follow your blog. My pen name would be Phoebe Kezrone which is my current dog's name and an acronym of previous dog's names. Great question! I'm a blog follower. Thanks for the giveaway! I'd choose Rose Amond for a pen name. Kalliope Nazneen Shulamith (my initials). I follow you via fb & your blog already! I am a follower of your blog! And my pen name would be sunny writer. I am so excited to finally (and officially) share with you the new book from the Moda Bake Shop chefs. Sweet Celebrations with the Moda Bake Shop complied by Lissa Alexander will be on the shelves in October this year. Yippee Skippee!!! So exciting!!! I love your snowflake quilt!! I can't wait till the book comes out. 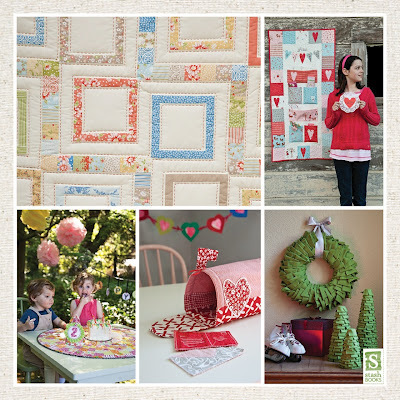 Love your quilt and can't wait to see your other designs. congrats!how exciting! I like what I see so far. That's so cool! I think this book will be a Christmas gift for myself 🙂 I have the first one 'Fresh Fabric Treats' and I really really like it, hope the 2nd one will be even better! Awesome Jane! I am super excited for you! Congratulations! I've only just started following your blog (and I think I stumbled upon it because of either Moda or Pinterest) but was so excited to find someone from Brisbane who blogs about Modern Quilting!! I thought it was completely US dominated so was disappointed! I shall look forward to the new Moda book – your snowflake quilt looks absolutely delightful. I'm looking forward to continuing to read your blog too! You clever cookie, so well deserved.